Some of the coldest air in 20 to 30 years is expected in the Great Lakes Region by the middle of next week. Computer forecast model guidance is agreeing on low temperatures below -10° with some numbers as extreme as -30° showing up for big cities like Minneapolis and Chicago. In addition to the cold air, blustery winds may create wind chills in the range of -40° to -60° Wednesday into Thursday. The last time Minneapolis registered a low temperature below -24° was 2004 and the last time the mercury plummeted to -30° or lower was 1996. In Chicago, -30° has never been recorded and -24° was met in the bitter winter blast of 1985—a cold snap that is being reference for comparison to this upcoming event. This may lead some to say, “whatever happened to that good old…” well, you can finish the sentence. In statistical fact, these episodes are becoming less frequent with climate change. 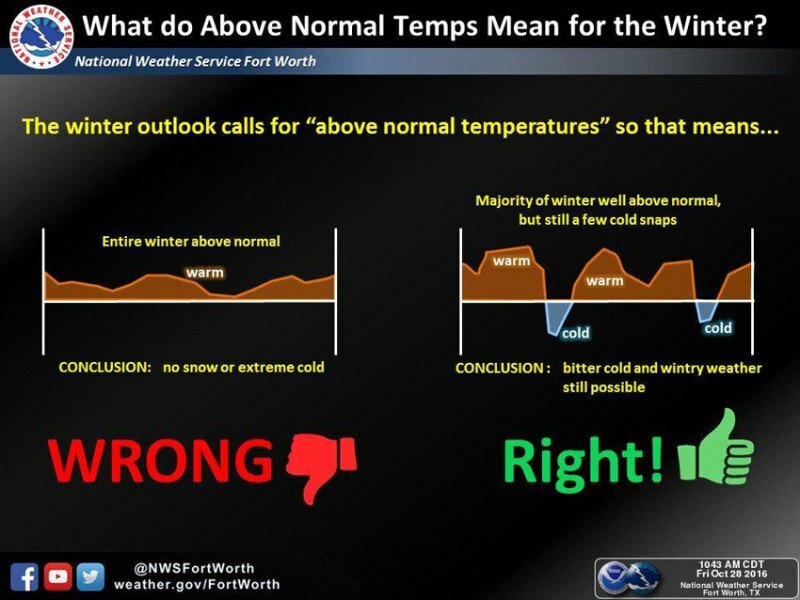 It is also important to remember the newly popular phrase among forecasters that “weather is not climate.” Using the graphic from the National Weather Service in Fort Worth, Texas as a guide, realize that above average or increasing temperatures is about a trendline in the climate of an area. Climate is the long-term weather of a specific area over a time scale of months, years and decades. Weather is the short-term state of the atmosphere, subject to much greater fluctuation over a time scale of hours, days and weeks. While dangerous cold is not needed by anyone, low temperatures and ample snowfall are important to a healthy economy. Skiing, snowboarding, snowmobiling, tubing and other winter recreation — are part of an industry that contributed more than $20 billion to the national economy in the 2015-2016 season. These conditions are under threat from warming winters, according to a new report from Climate Central. A common theme in climate change trends is more drastic warming across the middle and high latitudes. 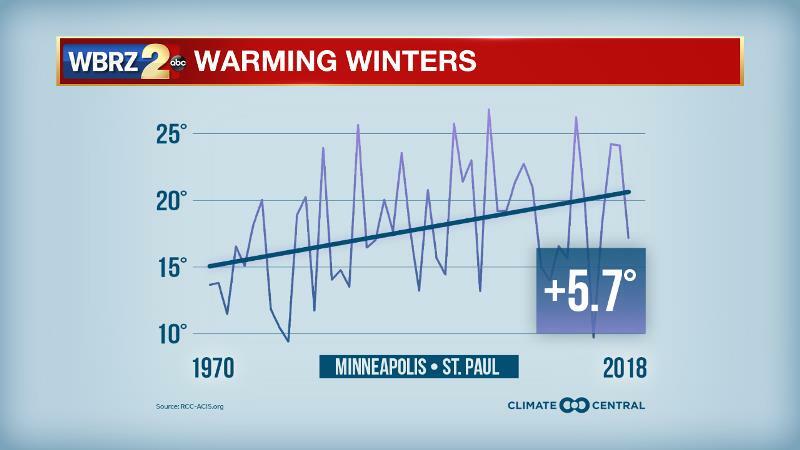 Minneapolis is one location that has experienced substantial warming over the last 40 years. The warming is affecting regional snowfall patterns differently, but from the 1970s to 2010s, 57 of the 107 analyzed weather stations saw the average annual snowfall trend downward by at least an inch. The biggest losers were Flagstaff, Arizona; Salt Lake City, Utah; and Casper, Wyoming — all historically snowy Western cities that are getting drier overall. Since the 1970s, annual snowfall has dropped by a total of 48, 31, and 29 inches in those cities, respectively. Of course, the increase in winter temperatures has a less drastic impact on the Gulf Coast economy as winter recreation is a much smaller part of revenues. In fact, milder winters may even assist industries like crawfish farming. 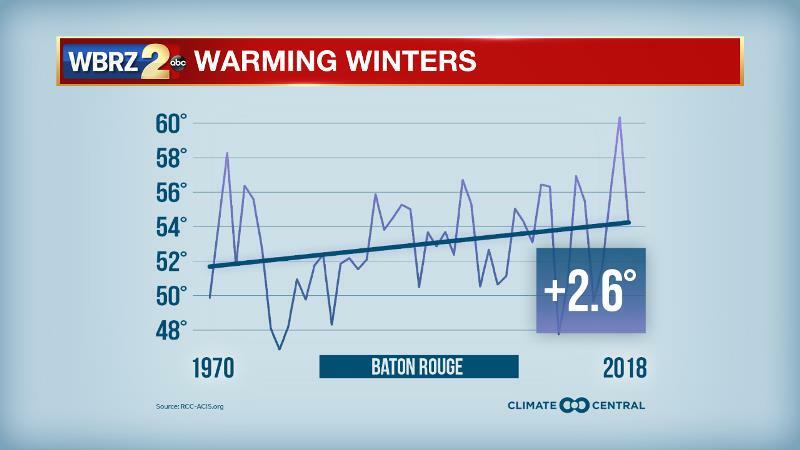 Baton Rouge averages about 20 episodes of freezing temperatures each winter. So far this season, there have been 6 as of January 24.